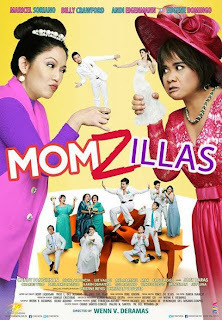 'Momzillas', the comedy movie starring the Diamond Star Maricel Soriano and the Rough Diamond Star Eugene Domingo, has grossed P42.5-million after 2 weeks in the Philippine Box Office. 2' which for 2 weeks reigned on top of the box office in the Philippines now with a total gross earnings of P88.8-million and is still drawing huge number on its 3rd week. Co-produced by Star Cinema and Viva Films, and directed by Wenn V. Deramas, 'Momzillas' with 2-week gross of P42.5M can't be considered a hit since it's a Deramas film, which at least should be grossing above P50-million already by the end of its 2nd week. But it's just a slight miss, especially when compared to the substantial miss in the box-office by "On The Job", a big-budgeted Star Cinema film which opened 2 weeks ahead of 'Momzillas' but only brought in P13.5-million after 3 weeks. 9 months have passed, and so far only 3 Filipino films have grossed above P100M ('It Takes A Man and A Woman', 'Four Sisters and a Wedding', 'Bakit Hindi Ka Crush Ng Crush Mo? '), 3 movies earned above P50M ('Bromance: My Brother's Romance', 'A Moment in Time', 'Must Be...Love') and 'Momzillas' is already the 7th highest-grossing Pinoy film of the year as of this posting. The rest have grossed below P30M, and 3 of those movies were really big disappointments ('My Lady Boss', 'On The Job', 'Seduction'). We'll see how 'Kung Fu Divas', which opened just last Wednesday (Oct. 2), will fare in the box-office. A hit or a miss? You'll find that out on my next box office updates.